In the spring of 1900, the Boxer Rising broke out. Led by a shamanistic secret society devoted to traditional martial arts, the revolt was directed against foreigners, especially missionaries, who, deep in China’s interior, were seen to be undermining and insulting Chinese beliefs and practices. As spontaneous as the Indian Mutiny of 1857, the Rising attracted a motley crowd of disgruntled Chinese including peasants and decommissioned soldiers, smugglers, and even some officials and gentry. The Boxer Rising revealed the resourcefulness of ordinary people’s resistance as well as the depth of popular resentment of the foreign presence in China, and of the pressures it put on local officials. Few Chinese people ever saw a white man, but their lives were deeply affected by the new facts created by foreigners in China: the subjection to global economic cycles, for instance, which threw people out of work. A country whose standard of living was superior to Europe’s before 1800 had steadily become through the nineteenth century a helpless giant before Western missionaries, businessmen, diplomats and soldiers. Foreign debts and indemnities placed a crippling burden on the national exchequer. The government had to borrow heavily for the smallest attempt at modernization; even the railway, a symbol of progress everywhere else, only served to push China deeper into debt while opening up large parts of China’s interior to foreign troops. The Boxers reflected a long-simmering public rage by tearing up railway tracks. 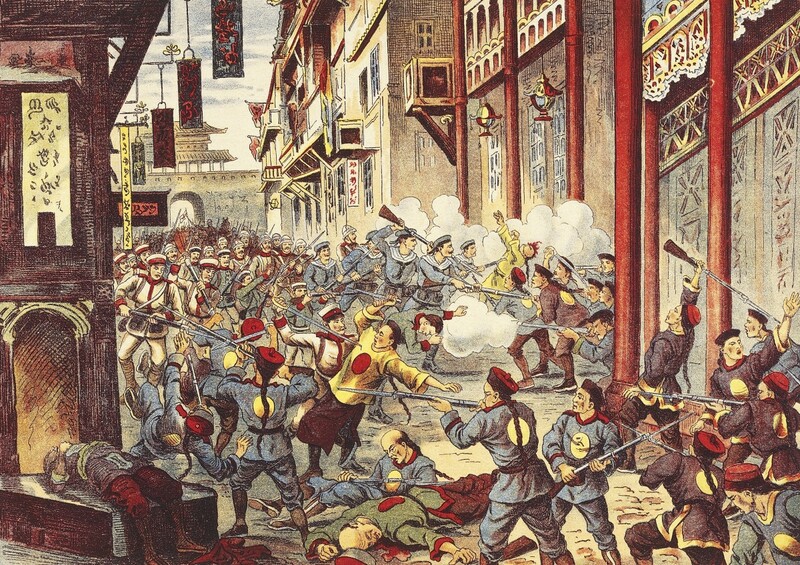 When Boxer attacks on Westerners and Chinese converts to Christianity spread to Beijing in June 1900, Western powers protested to the dowager empress, who calculated that she could use the Boxers against the Westerners and rid China of them altogether. The decision reflected a total ignorance of the real balance of power in the world. Her opportunistic declaration of war while the foreign legation was under siege by the Boxers was soon matched by a military mobilization against her by all the major world powers. 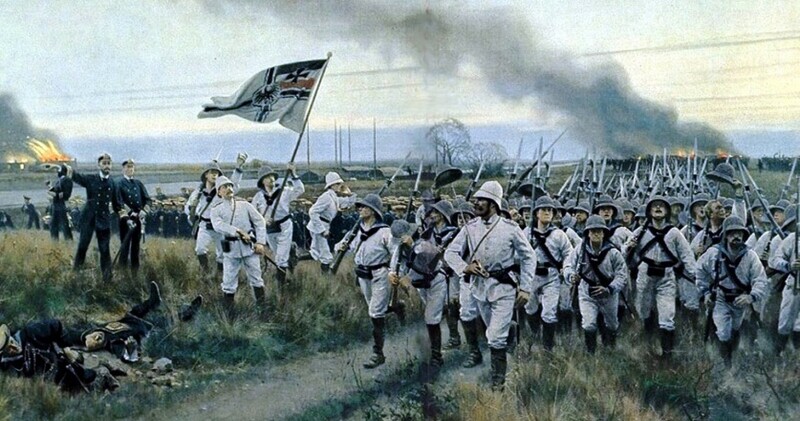 Twenty thousand troops drawn from several countries, including Japan, marched to Beijing to relieve the siege and loot the city. ‘Even hearts of stone’, Singh wrote, ‘would have melted and felt compassion.’ ‘It was not necessary for my heart to be moved by pity’, he added, ‘because I had come to fight against the Chinese. But … I felt an emotion that was born not out of duty but in the mind.’ Trying to understand his sympathy for the Chinese, Singh realized it was because the Chinese were Buddhist, like many Indians, and therefore ‘neighbours and fellow residents of Asia’. Re-living her escape from the barbarian-besieged capital in 1860, the dowager empress fled Beijing disguised in the blue costume of a peasant. Her representatives signed another agreement with Western powers that, among other penalties, imposed an indemnity almost twice the size of the government’s annual revenues. They promised to build monuments to the Christian missionaries murdered by the Boxers and, while accepting restrictions on the size of their military, had to countenance an increased foreign military presence on Chinese soil. China has been educating, training and arming herself with a speed of which the outside world has a very meagre conception. She has sent out a Commission of Observation to the West and decided to develop constitutional Government within the next ten years. She has pushed forward the work of revolutionising her system of education. I began to have a certain amount of political consciousness, especially after I read a pamphlet telling of the dismemberment of China. I remember even now that this pamphlet opened with the sentence: ‘Alas, China will be subjugated!’ It told of Japan’s occupation of Korea and Taiwan, of the loss of suzerainty in Indo-China, Burma and elsewhere. After I read this I felt depressed about the future of my country and began to realize that it was the duty of the people to help save it. Among other reforms, the army was modernized. A new, professional elite of army men soon emerged, particularly under Yuan Shikai (1859–1916), a general in the old Qing army. The military academy established by Yuan south of Beijing initially trained, among others, the future Nationalist leader – and Mao’s rival – Chiang Kai-shek (1888–1975). A glamorous militarist strain appeared in Chinese urban life which had so far conferred prestige on silk-robed Confucian gentlemen with a gift for poetry and calligraphy. Voluntary organizations dedicated to modernizing and strengthening China sprang up in both China and the Chinese diaspora. The reforms also had consequences not obvious to the Qing reformists. 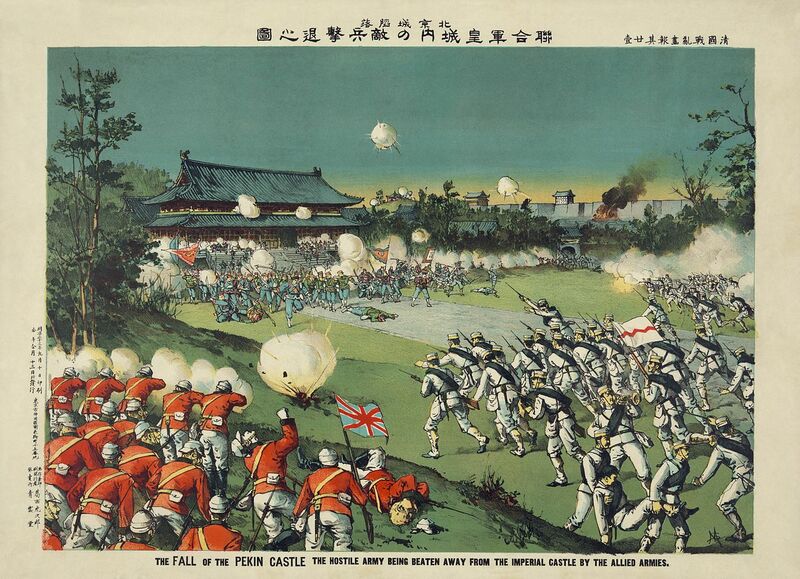 Students who had become deeply politicized by their stay in Japan returned to form enduring anti-Qing alliances with like-minded graduates of the new schools and military academies. Many of these were radical nationalists in the European Social Darwinist style, borrowing from the examples of Germany and Japan to posit a Han ‘national essence’ against alien Manchus. Revolution is a universal rule of evolution. Revolution is a universal principle of the world. Revolution is the essence of the struggle for survival or destruction in a time of transition. Revolution submits to heaven and responds to men’s needs. Revolution rejects what is corrupt and keeps the good. Revolution is the advance from barbarism to civilization. Revolution turns slaves into masters. With our people and our culture in their proper places, I must seek to irradiate their splendour. My will has not yet achieved its end. I am still shackled by the enemy state. Others will follow me to renew the golden flame. If our nation’s antiquity and our people’s historical record should come to an end in my hands, and the continuance of China’s broad and magnificent scholarship be severed, this will be my crime to bear. From Hawaii, Liang Qichao followed the news of China’s greatest humiliation yet, and the last of his old beliefs began to die. In a letter to Kang, he denounced ‘the slavish mentality’ of the Chinese people. In this bleak world that China found herself in, where ‘battle is the mother of all progress’, Confucius could no longer be the sole guide. Nor could constitutional monarchy be the right system for a people who desperately needed to be educated and mobilized around a strong nation-state. Liang was moving close to a break with Kang Youwei, who still believed that a wise and paternalistic monarchy could launch China into modernity. Kang had tried to stoke an armed revolt during the Boxer Rising. Failure forced him to seek refuge in Penang, where he quarrelled with Sun Yat-sen; he then moved to India in December 1901. He spent a year in the Himalayan resort of Darjeeling, during which he finished his treatise called Book of the Great Community, which offered a utopian vision of a post-nationalist harmony. Like many Chinese thinkers of his period, Kang turned out to be less a nationalist than a utopian internationalist. As he saw it, a universal moral community of the future would transcend all distinctions of race, ethnicity and language, and would even dissolve the family – a vision that would be resurrected in China under Mao Zedong.